I moved again, into a place that this time is mine. I own it. The whole thing. Both bedrooms, the kitchen, the balcony, all of it. The fridge and washer and dryer and everything else in the laundry closet and the cabinets. That is a lot of stuff to fall under my possession so suddenly. Since I’ve moved in, I’ve become a little, or maybe a lot, obsessed with making it look good. Exactly the way I want it. I care about it all. The colors on the wall, the brass hardware (gross), at which position this lamp should be on this table and how the chair in the corner is angled. Now that I own something, I want it to reflect me accurately. And I especially want the giant mural over the fireplace in tribute to the great state of Tennessee gone asap, as well as the faux-painted marble columns in the dining room. No, I’m not making either of those things up. 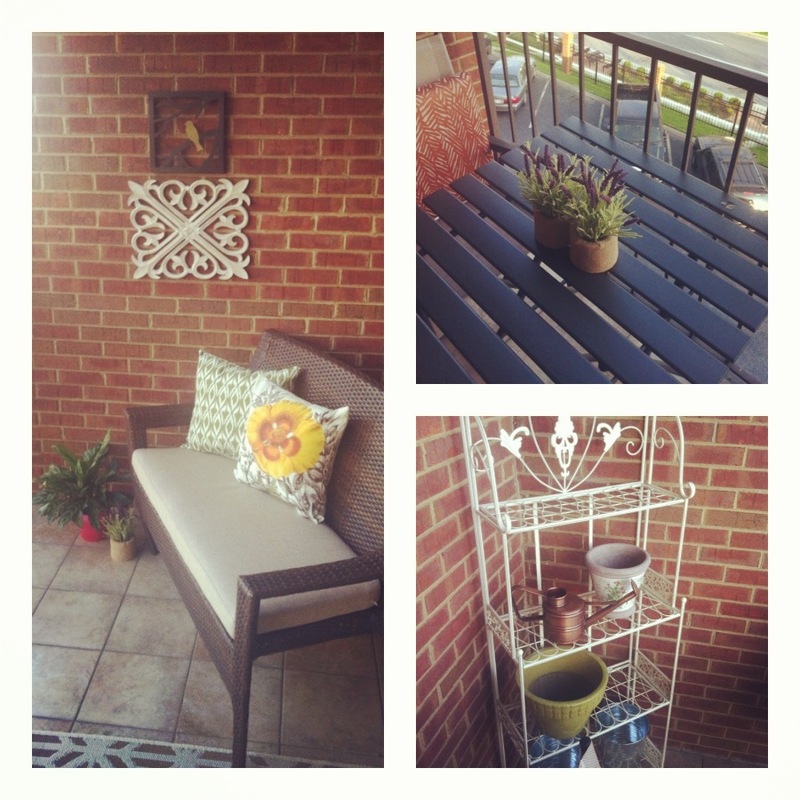 A few days ago, I spent all day working on my balcony. Several hours spent working on about 20 square feet of space. I got pretty carried away and looked at the clock just in time to get ready for my friend’s birthday party. Why am I doing it? Pouring myself into project after project, corner after corner of each room– why do we care so much about our houses? I say “we” when I may be in the minority, but I know there are others of you out there: you nesters, decorators, shoppers, ottoman-scavengers, just like me. It makes me wonder what we’re decorating and arranging and re-arranging, what we’re actually making look nice. I’m no psychologist but I did take one semester of psychology my freshman year of college so you should probably write this down: I think when we rustle about in our homes, setting them up just so, we are wishing we could do that with ourselves and maybe even believing we are doing that with ourselves. We wish that inside of our souls, in the dark parts, we looked as nice as our freshly painted kitchens with the silent-shut drawers. If we cannot create perfection within our confused and sinful selves, we strive for it within the houses we build. I’ve seen it in my condo obsession and I’ve seen it in my interactions with others. I like to know the right things to say to whom and when. The things that will make me look good and, above all, make that person like me. If I don’t know the right thing to say then I try really hard to figure it out, and if I can’t, I’m lost until I can. The work is tiring and endless. The work of perfectionism. When I looked at the time after working so hard on brainstorming what type of hanging plants to purchase for my balcony, I had to tell myself, “Just quit. The work could always keep going. You have places to be. Take a break.” I was speaking truth to myself. The work of perfection is never-ending; there is always more to do, and I wonder what places it is preventing us from being. I want to come drink coffee on that balconyJ Love it! Spot on with all our striving efforts…decorating or otherwise. Thank you for sharing your giftedness with the world! !